Although it is the general preferred practice, using teeth as orthodontic anchors can have drawbacks in some cases. For example, there may not be a viable tooth located at the point where an anchor is needed. Additionally, when greater force is required the teeth used as anchors could themselves begin to move out of place. 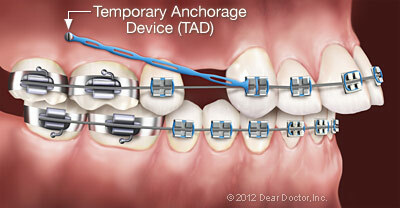 TADs can eliminate the need to use teeth as anchors and/or stabilize teeth that have moved out of place. TADs are small, screw-like devices that are placed into the bone of the jaw, similar to dental implants. Unlike implants, however, they don’t always need to become integrated with the bone itself. They are much easier to put in and fix in place, then remove when orthodontic treatment is complete. Furthermore, placing TADs is a minimally-invasive, pain-free procedure that takes just minutes to complete. After the area being treated is numbed, a patient feels only gentle pressure as the device is inserted. Most patients do fine following the procedure, but an over-the-counter pain reliever can be taken if needed. Note that taking out TADs later on is even easier! Not every orthodontic patient needs TADs, but for those who do, it’s a treatment option that offers clear benefits. If you have any questions about the procedure, or braces in general, please feel free to contact us! We are always glad to talk with you and address your concerns over the phone or in-person at our Gallatin or St. Joseph, MO office.